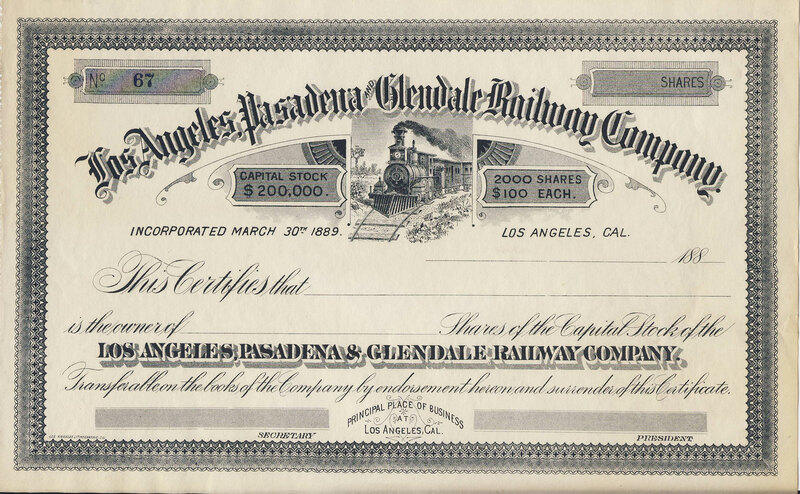 An unissued stock certificate from the Los Angeles, Pasadena and Glendale Railway Company. Donated to the Mount Lowe Preservation Society by Rick Wright. The Los Angeles Terminal Railway Company.—This company was organized January 2, 1891, under the general laws of California for the purposes of consolidating the Los Angeles & Glendale Railway Company, the Los Angeles, Pasadena & Glendale Railway Company, and the original Terminal Company. These roads owned lines aggregating 16.40 miles. The Los Angeles & Glendale Railroad Company.—This company was incorporated under the general laws of California January 13, 1887, for the purpose of constructing a railroad from Los Angeles to Glendale, Calif. Its charter was amended October 8, 1888, under the name of the Los Angeles & Glendale Railway Company. It built 6.50 miles of road through John Cross as contractor. The cost to him is not known, but the company voted him $75,000 par value in stock. Additional stock to the par value of $25,000 was subscribed for, and at least 10 per cent of par value thereof was paid into the corporation. All the stock issued was later reacquired and issued to the Los Angeles, Pasadena & Glendale Railway Company in exchange for $100,000 par value of the stock of that company. The line was opened for operation in March, 1888, but no accounts are in existence from which the gross and net earnings can be determined. The Los Angeles, Pasadena & Glendale Railway Company.—This company was incorporated March 30, 1889, under the general laws of California. 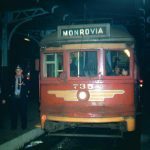 It constructed 6.4 miles of standard-gauge railroad between Los Angeles and Pasadena, and 1.8 miles of narrow-gauge line between Glendale and Verdugo Park. A third rail was also laid on a part of the standard-gauge line. The cost of construction can not be satisfactorily ascertained. The company issued $100,000 par value of stock in exchange for stock of the Los Angeles & Glendale Railway Company, and $100,000 additional for $22,000 cash and for organization expenses the amount of which does not appear. It issued also $200,000 par value of bonds […] of this between road, equipment, general expenditures, and other purposes has been already set out in the history of the Terminal Company. The remainder represents the par […] total operating loss of $8,187.87. The original Los Angeles Terminal Railway Company.—The Los Angeles Terminal Railway Company, Incorporated August 29, 1890, under the general laws of California, called herein the original Terminal Company, commenced but did not complete the construction of 1.70 miles of railroad within the city of Los Angeles. It issued stock to the par value of $150,000. From the books of the Los Angeles, Pasadena & Glendale it appears that the latter company advanced to the original Terminal Company $156,683.91 for construction and other purposes. Upon the consolidation before referred to the Terminal Company exchanged $150,000 of its stock for the same amount of stock of the original Terminal Company then outstanding. The Los Angeles & Pasadena Railway Company, and the Los Angeles & Raymond Railway Company.—The first of these companies was incorporated June 27, 1884, and the second April 14, 1887, both under the general laws of California, Neither constructed any mileage and neither apparently issued any stock or bonds. Aside from the receipts referred to and quoted in the history of the Terminal Company there is no evidence in any records that have been found of expenditures by or for either company for property. These companies were eventually absorbed into the Union Pacific, and the Glendale line was operated with electric power by UP after the Glendale & Montrose Ry. was abandoned around 1930. Does anyone know if this is the railraod that ran up through Pasadena starting around where the current gold line crosses E. Glenarm? There’s very few signs of that old line anymore but it ran north/ease from the intersection of E. Glenarm and Raymond through where the 710 runs now. You can see where the old right of way was between 1000 s. Fairoaks and the building just to the south on google images or on http://www.historicaerials.com. While this certificate is not stamped as a “Specimen”, I wonder if it was held for use by an examiner. To prevent redemption fraud, it would be necessary to hold a true sheet on file for comparison to those being brought in.